White chicken enchiladas smothered in a creamy white sauce made with cream cheese, green chiles, and Monterey jack. 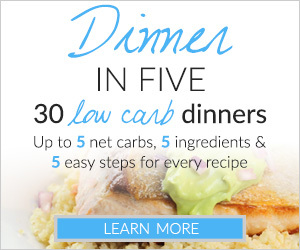 Enjoy this crazy easy low carb and insanely delicious recipe. Have you tried white chicken enchiladas? I grew up eating them. Instead of being sauced with a traditional red enchilada sauce, white chicken enchiladas are baked with a creamy white sauce. Most white chicken enchilada recipes feature a bechamel sauce or cream sauce made with flour. Since this is a low carb enchilada recipe I offer a white cheese sauce instead. All recipes for white chicken enchiladas start with seasoned shredded chicken. 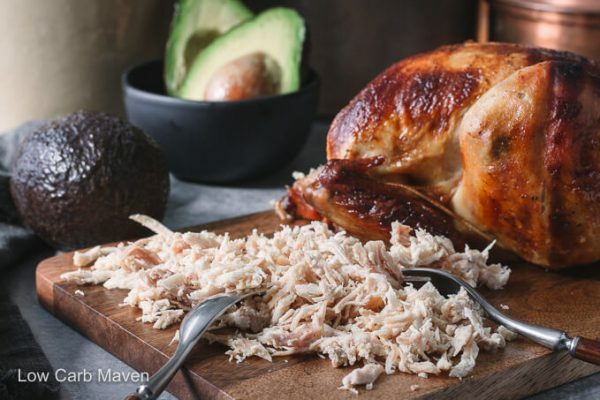 I use shredded rotisserie chicken or a whole roasted chicken because it is moist and flavorful. Shredded chicken breast (poached chicken) is fine, too, but it’s important to add chicken broth to moisten the meat. I use the accumulated juices from the rotisserie chicken for the most moist and flavorful chicken filling. Seasoning the filling well with salt and pepper, is crucial and can’t be skipped. Layering flavor makes even the most simple dishes taste delicious so season each step of the way. My white cheese sauce for these enchiladas is so easy to make. Cream cheese and Monterey Jack are melted in a pan with spices and green chilies. It literally takes about 5 minutes. The white enchilada sauce is added to the pan and over the top of the enchiladas before baking. Chicken enchiladas rolled in Cut Da Carb Wraps. 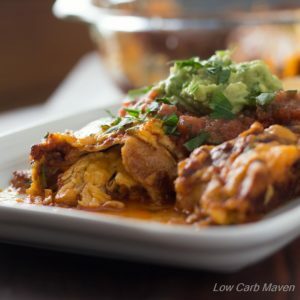 I generally use low carb crepes or low carb tortillas when making chicken enchiladas. I tested this recipe with both and it worked beautifully. But, I also tried a newer product called Cut Da Carb Wraps, which I cut in half and wrapped around the filling. I show it in the pictures. All three versions were delish. The founder of Cut Da Carb Wraps is very nice and graciously sent me two packages. 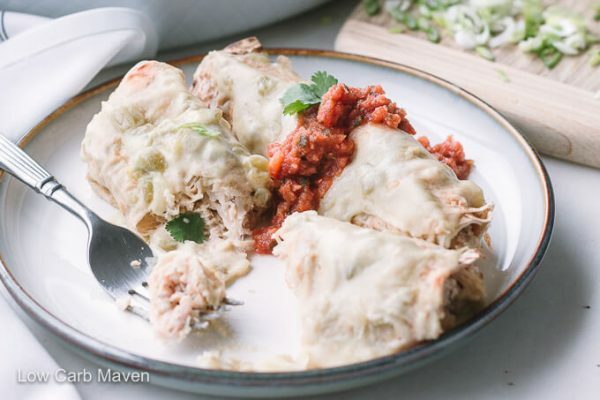 They are great to wrap around sandwich fillings, but I like using them for enchiladas the best! 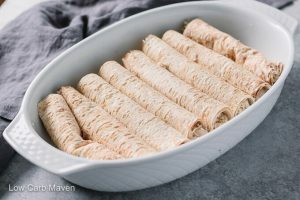 They are not gluten-free so use my crepe recipe for a GF option and also the lowest carb counts! Because of the white cheese sauce, these white chicken enchiladas are very filling. We topped ours with sour cream and a nice store bought salsa. Serve with a salad dressed with a tangy vinaigrette for a standout meal! 2.5 Net Carbs per each White Chicken Enchilada! Pre-heat oven to 350 degrees F. Butter or spray a 9x13 inch casserole dish. Shred the chicken if you haven't beforehand. If the shredded chicken is cold from the fridge, heat until warm. Then, season liberally with salt and pepper. It should taste really good before you continue. Place all of the sauce ingredients into a non-stick pan over medium heat. Melt the ingredients, stirring occasionally, to blend. Let the sauce simmer very gently for several minutes until thickened, stirring occasionally so it doesn't burn. Adjust seasoning per your taste. Remove from heat. Spread 1/2- cup sauce in the base of the casserole dish. Place a crepe (tortilla or wrap) on your work surface and add 1/2 cup of shredded chicken. Roll up like a cigar and place seam side down into the casserole dish. Repeat. 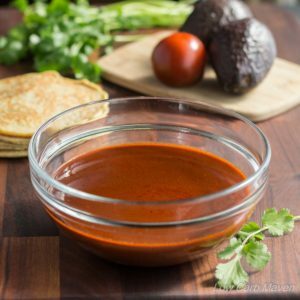 Pour the rest of the sauce over the filled enchiladas and bake in the middle of the oven for 20-30 minutes or until bubbly. Serve. Serving size is 1 white chicken enchilada. Serves 8, at 2 net carbs each. Nutritional Information shown in label is with low carb crepes. These are delicious. Next time I’m going to try to add some sour cream and chilis to the meat mixture. My hubby requested pepperjack cheese on top next time too. I love how easy it is to personalize a delicious recipe like this! 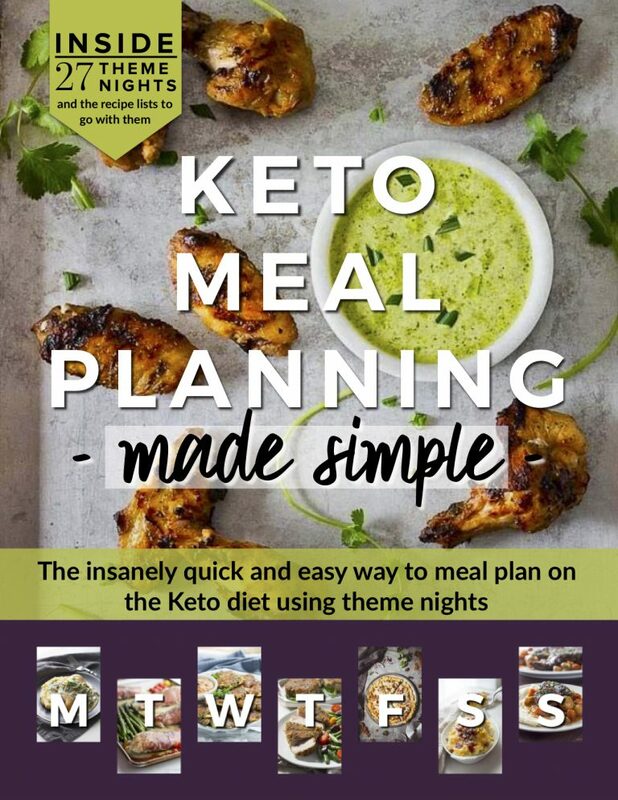 Great job and thank you for sharing this with the keto community! 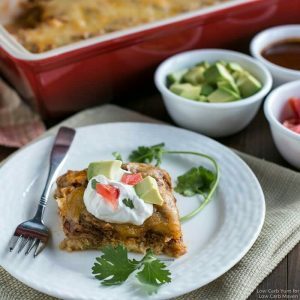 Can I use a low fat cream cheese instead of regular cream cheese in the white chicken enchilada recipe? By chance, have you tried these with cabbage leaves? Made these tonight and they were delicious thanks for the recipe. What is a substitute for xantham gum? 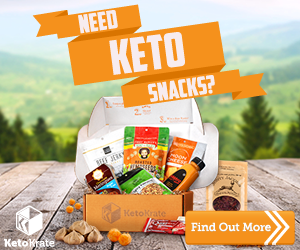 I am new to the Keto diet, and my husband is Diabetic. This is the first thing that I made that blew our socks off! This recipe is so tasty that all you need is a salad to go with it. Thank you for creating a dynamite recipe! 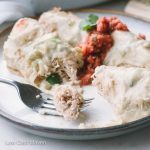 I love these white chicken enchiladas and have made them several times! You should definitely try them! 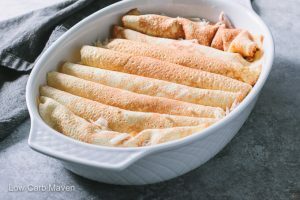 I substituted coconut wraps for the crepes but I do want to try making the crepes one on these days. Is there a way to upload your recipes into myfitnesspal? I’ve tried to do it a few via my phone and I keep getting an error. Also, you are totally saving my life with all these recipes!! I’ve never felt so excited to do a lifestyle change and be healthier!! I cannot thank you enough, for this recipe. Absolutely delicious!!!!!! Wish I could attach the photo of our finished product. I was going through MAJOR Mexican food withdrawal!!!! Cant wait for lunch leftovers tomorrow! Your fabulous low carb wraps. I put it all together, waited on hubby to get home. Covered it with foil, baked in a low 325* for 40 mins. Uncovered and turned on the broiler for a few to “color” the top. They were absolutely amazing. These look absolutely terrific. 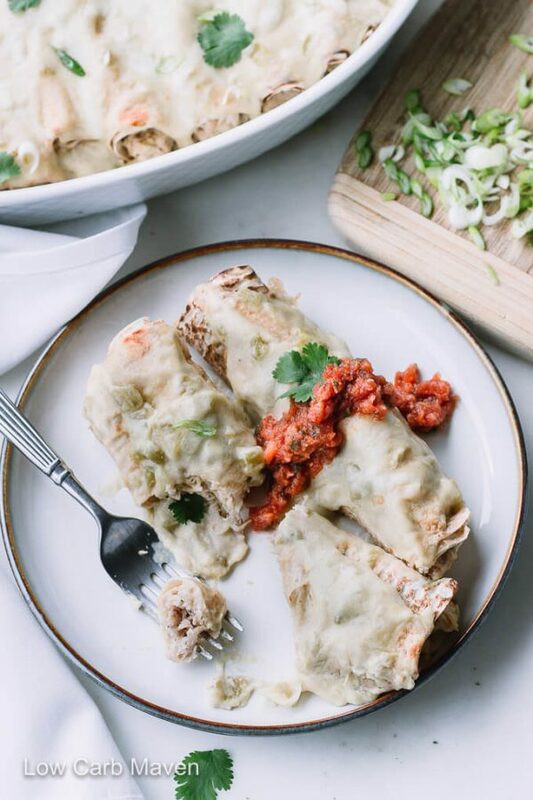 Enchiladas Suizas (with white sauce) used to be one of my favorite dishes….NOW THEY ARE BACK ON THE MENU! THANK YOU! I usually like mine with salsa verde but these look so good I will have to try the red salsa as well. 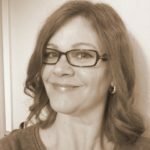 Kim, just saw a great recipe on Bon Appetit (Rhubarb Custard Cake) that is BEGGING for a low carb makeover. Looks like a great candidate. Hoping I could temp you into giving it a go. Its an eggy batter poured into a springform pan with rhubarb laid across the top like a patchwork quilt. The trick would be how to sub the flour for almond and/or coconut flour. Your the gal that could do it. Hoping you will take a look. Thanks, Deborah. I love these so much. My family had no problem devouring them while I tested the recipe with the cut da carb wraps and the crepes and worked on the cheese sauce. They are pretty great. I used the red sauce to provide a bit more contrast on top, otherwise I would have used salsa verde in the photos. I have never made a custard cake before. It sounds delish. Maybe I’ll make the real version first for the family before I try a low carb version. I love the pattern of the rhubarb and think it might be pretty for Mother’s Day.